Update: Maurice White passed away in February 2016. Here’s the rare interview we did with him in March 2007. At the time, he had already been suffering from Parkinson’s disease. but he was still active in the recording studio, working with contemporary artists, who sang new versions of his Earth Wind & Fire songs for a special album project. 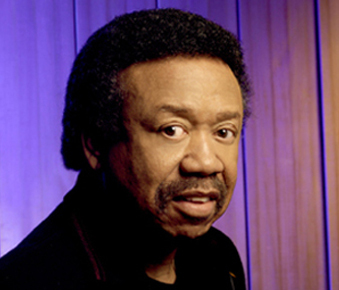 Maurice White is a genuine R&B/pop legend. As leader of the Grammy-winning, multi-platinum group Earth Wind & Fire, he has been their lead singer (along with Philip Bailey), main songwriter, and record producer. The group has enjoyed enormous success for the past three decades, creating such memorable, chart-topping hits as ‘Shining Star,’ ‘September,’ ‘Let’s Groove,’ ‘Boogie Wonderland,’ ‘After The Love Has Gone,’ ‘Reasons,’ ‘That’s The Way Of The World,’ ‘Sing A Song,’ ‘Fantasy” and “Serpentine Fire.” With their hits and acclaimed albums, EW&F forged a distinctive sound which seamlessly fused R&B, jazz, funk, pop, gospel and rock. Although White no longer tours steadily with EW&F (due to health reasons), he remains very active in the recording studio, producing new projects and writing songs. His latest album project is Interpretations: Celebrating The Music of Earth Wind & Fire, which has just been released on the newly revitalized Stax label (marketed and distributed by Concord Records). This album was executive-produced by White, and features 10 new recordings of EW&F songs by contemporary hit artists who have been inspired and influenced by the group. Interpretations includes recordings by such artists as gospel star Kirk Franklin, whose excellent version of ‘September’ has been released as the first single. Other top artists who recorded EW&F songs for this album are: Chaka Khan (‘Shining Star’), Musiq Soulchild (‘Reasons’), Angie Stone (‘Be Ever Wonderful’), Lalah Hathaway (‘Love’s Holiday’), Me’Shell Ndegeocello (‘Fantasy’), Mint Condition (‘After The Love Is Gone’), Dwele (‘That’s The Way Of The World’) and Ledisi (‘Devotion’). In a special new interview, White took time out to talk about the Interpretations album, and how the project came together. He also spoke about his songwriting, and how he wrote such classic songs as ‘Shining Star’ and September.’ And lastly, when asked, he gives advice to young songwriters and artists who are trying to break into the music business. DK: How did you come up with the idea for the Interpretations album? White: It was two years ago that the Grammy Awards had a special tribute to EW&F, which featured other artists (including Chaka Khan) performing our songs. It turned out great, so I thought it would be a good idea to create a new album with artists recording EW&F songs. We put together a list of artists to contact – the artists could choose which EW&F songs that they wanted to record. Then we approached Concord Records with this concept, and they became excited about releasing this album. They later decided to make Interpretations the first release on their revived Stax Records label. I was honored that our project was chosen to re-launch Stax, I loved Stax Records – I’m from Memphis and I knew many of the original Stax artists and musicians. (Concord had earlier purchased the Memphis-based Stax label, which featured such R&B/soul greats as Isaac Hayes, the Staples Singers, Sam and Dave, and Booker T. and the MGs). 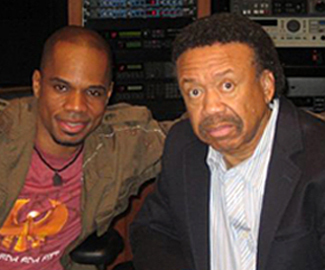 Maurice White (right) with Kirk Franklin. DK: Were you involved in producing the new recordings for Interpretations? White: The artists produced their own tunes. I was the executive producer, and in some cases I would add production input and ideas. But the artists did a terrific job of producing and arranging their own versions. I think Kirk Franklin did a sensational job with his version of ‘September.’ It really is true to the EW&F sound and feeling. DK: It seems that practically all of the EW&F songs have a joyful feeling and energy, with a positive lyric message. Was that your plan when you wrote and produced your songs? White: Being joyful and positive was the whole objective of our group. Our goal was to reach all the people and to keep a universal atmosphere – to create positive energy. All of our songs had that positive energy. To create uplifting music was the objective. DK: EW&F was known for its terrific fusion of musical styles, and for the vocal interplay between you and Philip Bailey. How did you create this sound? White: I always envisioned a band which was self-contained, which could play many styles of music, and which could still create its own sound. It was also great to feature a big horn section in the band. As for our vocals, it really worked that Philip and I sounded so different from each other. DK: One of my favorite songs is ‘Shining Star,’ which you wrote with Philip Bailey and Larry Dunn. How did you write this song? White: We were recording our album in Colorado. We were walking around at night ‘ it was in the countryside and we could see the stars at night. We decided to write a song called ‘Shining Star.’ I helped write both the track and lyrics. We put the rhythm together and the melody. When we were in the studio first creating the song, Philip would play percussion, and I played the drums. Larry Dunn played the keyboards. DK: Did you know right away that this would become a breakthrough hit? White: At the time we wrote it, I didn’t know it would be a hit. But we were very happy with the song – we knew that it came from inspiration. Maurice White appears in this video, in the latter half of this song. DK: How did you write your hit ‘September’? White: ‘September’ was written by me and Al McKay. He would create tracks and play them for me. I really liked the track for ‘September’, so I came up with the melody for this song. DK: I noticed recently on TV that ‘September’ was featured in a commercial, and I’ve seen many of your songs in movies and TV. Has the group been actively pursuing uses in commercials, films and TV shows? White: ‘September’ has recently been in an Old Navy commercial. Sometimes we would get calls to use our songs, and sometimes we would promote our songs for certain films – we would contact certain film directors. Other times, we’re approached by ad agencies for commercials. I like how the right film or commercial can be a great vehicle for our songs to be heard – it keeps the music alive. DK: Lastly, what advice would you give to young artists and songwriters who are trying to break into the music business today? White: Young artists and songwriters need to stick to their guns. They should create music that they believe in and truly love. They should also learn as much as they can about music theory, and learn about all different types of music. It’s important to know that music should have no boundaries, that you can create whatever sound or style that you envision.